This tough bird netting seals off all structural openings and other possible roosting sites. 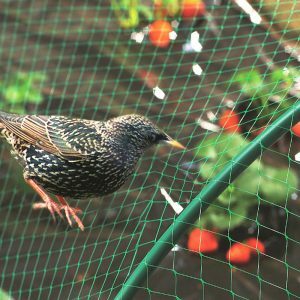 Lightweight, pliable, UV stabilized bird netting won’t deteriorate with age or lose strength when exposed to the elements. Standard mesh is 3/4″. Structual mesh is 1/2″. – Works on Other Animals: repels anything from birds to groundhog to deer. – Decreases aesthetic and materials damage to propery. – Prevent Health Department citations and fines.